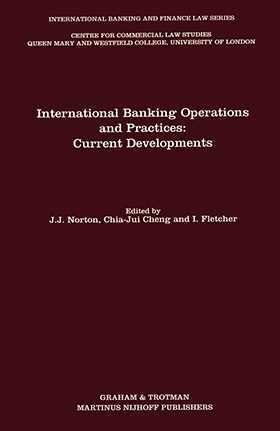 International Banking Operations and Practices: Current Developments is based on a conference which was held in Taipei on 22–24 June 1992. It represents a tightly coordinated and edited collection of scholarly and highly practical chapters prepared by leading experts on banking law. Important changes are taking place in the financial sectors in the Pacific Rim; vital roles are being played by Tokyo, Hong Kong, Singapore and Taipei. This volume deals with the relevant legal questions regarding the changing international financial practices and is divided into two parts. Part I deals with Foreign Banks in International Banking Operations, and Part II covers International Banking and Private Law. This collection, which was designed as a broad foundation for comparative analysis of changes and reforms occurring worldwide in international banking regulation and practice, will be an invaluable aid to all domestic and international government officials, executives of banking and other financial institutions, professionals (attorneys, accountants and other advisers) representing such institutions and academics, in trying to understand both policies and practicalities reflected by these rapid changes and reforms. A separate, but related, companion volume on international banking regulation and supervision has also been produced, entitled International Banking Regulation and Supervision: Change and Transformation in the 1990s , which deals with the broad policy issues entailed in the liberalization and deregulation of the banking industry.